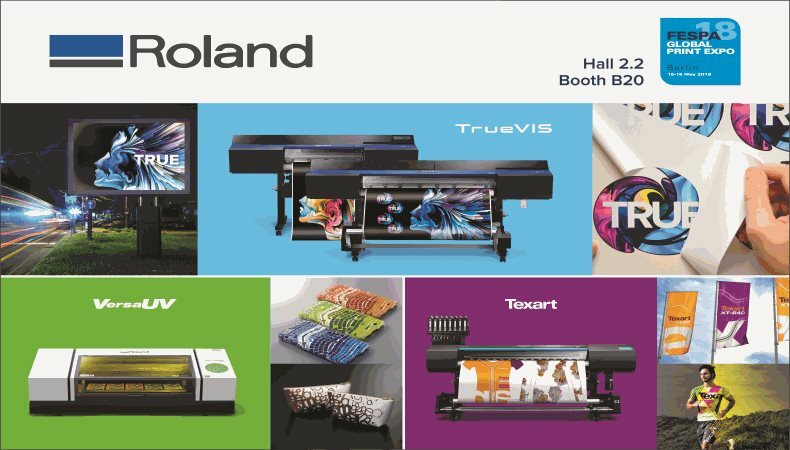 Roland DG have proudly announced that they will showcase the largest range of advanced print and cut, UV-LED and dye-sublimation solutions at the Global Print Expo 2018. Roland DG Corporation is a leading supplier of digital print technologies with over 35 years’ expertise in manufacturing. The company is well-known for their reliable and high-quality solutions and is the top print and cut brand with over 116,000 devices sold worldwide. You can find Roland DG at FESPA 2018 at Hall 2.2. Booth B20 where the company will cover the widest range of solutions across 6 different areas. What Key Solutions From Roland DG Will Be Demonstrated at FESPA 2018? Roland DG initially introduced eco-solvent wide format printer/cutters over 20 years ago and are the top choice for durable graphics globally. The company introduced the TrueVIS range in an effort to push the market forward. Roland DG’s existing ‘no compromise’ campaign demonstrates the fundamental ways how TrueVIS provides ‘true print & cut without compromise’ in regard to versatility, quality, reliability, productivity and return on investment. Roland TrueVIS VG-640/540 (1625mm and 1371mm) and SG-540/300 (1371mm and 762mm) printer/cutters are equipped with newly developed Roland DG FlexFire printheads which provides better control of the ink chamber plate and for a higher firing frequency. The FlexFire printheads deliver precision droplet placement in 3 different sizes with a 25% wider print pass compared to older Roland DG models. The combination of TrueVIS INK and FlexFire heads produces vibrant colours and stunning fine details at a production speed of 10.6m2 per hour in high quality mode on vinyl and up to 34.7m2 per hour on banner in dual CMYK ink configuration. Roland DG currently has a variety of options for Print Service Providers that are searching for a separate print and cut solution, including the award-winning Roland SOLJET EJ-640 eco-solvent printer. The EJ-640 has been acknowledged for exceptional performance and delivers productivity and quality output at low operating costs. Advanced features include outstanding media compatibility, an integrated tri-heater system, accurate media transit, Roland VersaWorks Dual PDF-based RIP and Roland OnSupport remote monitoring software which means that now unattended printing is easier than ever before. Roland DG will be exhibiting their advanced and affordable VersaEXPRESS RF-640 eco-solvent printer. The RF-640 or the EJ-640 can be configured as either standalone devices or paired with a cutter, for example a Roland GR series as part of an effective print then cut workflow. Last year, Roland DG introduced a new generation of professional vinyl cutters to its CAMM-1 series, the Roland GR-640/540/420. The GR series has been redesigned to produce high cutting quality and productivity due to increased speed, accuracy, media versatility and additional state-of-the-art cutting features. The brand new ergonomic L-shaped design of the integrated stand and machine guarantees precision cutting and stability even at the highest speed. The models are available in 1651mm, 1397mm and 1075mm cutting widths to enable users to pair them with existing inkjet printers that they are using. Montaro continues to comment that “the cutting industry has become gradually diverse. In addition to sign-making, cutting now consists of the production of vehicle and window graphics, window tinting and car protection film for personalized apparel, automotive restyling, packaging prototypes, labels and decals, paint/sandblast stencils and more. The range of applications requires the ability to manage a wide variety of materials of varying thicknesses such as reflective film, window tint, heat transfer materials that include carboard, flock and glitter and sandblast mask. The GR series makes this all do-able”. In the fashion apparel industry, the trend cycles are becoming shorter with a rising necessity for personalization that reflects individual lifestyles and preferences. In the sports apparel industry highly functional materials such as quick drying, sweat absorbing and dry touch features have become progressively popular. Digital printers including the Roland Texart XT-640 can easily provide custom one off and small lot production. This model is a dye-sublimation transfer printer that is designed specifically for the production of sports and fashion apparel, textile decoration, soft signs, curtains and other interior décor, polyester banners and flag and personalized gifts. The Roland Texart XT-640 features dual printheads to reach high speed performance at a usable print speed of 41m2/h. The rail and frame structure has been reinforced to allow very detailed printing with precise ink droplet placement. Roland Texart inks are optimized for dye-sublimation transfer printing and produces vibrant and bold colours and deep rich blacks. Violet, orange, fluorescent yellow and fluorescent pink combine with Roland DG’s Texart process ink colours to produce hundreds of vivid fluorescent hues. The Roland DG Fluor Colour Library swatch palette can be installed in Adobe® Illustrator® and CorelDRAW® for ease of use and colour customisation. There is a growing trend for highly personalised items and customers are using Roland’s VersaUV LEF printers to construct profitable businesses by providing on-demand custom printing services for a variety of personalised products. The Roland LEF-300 brings the VersaUV series into the mass production environment with numerous features to allow the decoration and customisation of items in high volumes. At FESPA 2018 Roland DG will exhibit the VersaUV LEF-300 and LEF-12i. The VersaUV LEF-300 has some exciting features including an enlarged printing area of 770mm wide by 330mm long. It is possible to print on a wide range of substrates including wood, acrylic, board, metal, plastic, glass plus fabrics and soft materials such as leather and eco-leather. The device prints directly onto a large variety of items including mobile phone cases, pens, personalised awards, signs, customised corporate merchandise, industrial goods, giftware, product prototypes and more.